The Series 75 manually operated pinch valve is the number-one selling pinch valve in the world today. The Series 75 is a reliable, maintenance-free, cost-effective valve designed for tough slurries, abrasives, and corrosive-chemical applications. The Series 75 full port design eliminates any dead spots or crevices, seats or bearings where slurry can hang up and impair operation or even cause complete valve failure. The principle of design is very simple, with few moving parts. Two mechanical pinch bars open and close the elastomer sleeve. The heart of this unique valve is the durable, flexible rubber sleeve, which is, reinforces with high-strength fabric. The sleeve, which is the only part of the valve exposed to the line process, eliminates maintenance and the need for expensive, exotic body materials. Valve operation will not freeze and operating torques remain constant, even if the valve has remained in the open or closed position for years, making it ideal for pump isolation. 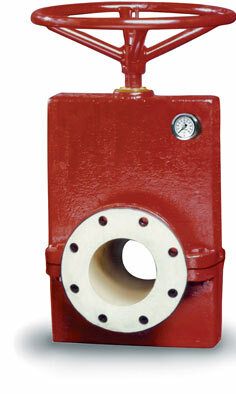 Series 75 Pinch Valves have the same face-to-face as gate, plug, or ball valves, ANSI 16.10 up to 6” sizes. Sizes 8”, 10”, 12” available ANSI 16.10 with Reduced Port or Cone Sleeves. The Series 75 has excellent control characteristics and can be used as a throttling manual control valve. By simply turning the handwheel, operators can fine-tune the valve position to maintain a constant rate of flow; few manual valves have this throttling advantage. Zero leakage is maintained bi-directionally.